Extra Episode – Welcome to Donetsk! Today’s episode is an extra – a report about how it’s like to live in the pro-Russian separatist territories in eastern Ukraine. Don’t worry, I’ll hit the revolution soon enough – in fact, I already started recording that episode, but…I received fresh information about what’s going on in Donetsk and Luhansk literally yesterday morning – so I spent the whole day, translating matherials, scripting and recording, to bring you the most current, most accurate report, straight from the people, about how it’s like in eastern Ukraine today. Enjoy! Picture for today is glorious DonMak! 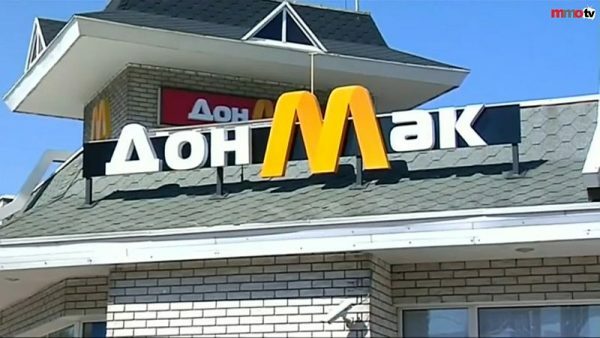 McDonalds ripoff in the city of Donetsk. It is amazing! 8 Comments on Extra Episode – Welcome to Donetsk! Very interesting stories. Thanks for translating these. In the US, the Crimean crisis was reported widely and the occupation of Donetsk and Luhansk were mentioned but they’ve long been almost entirely out of the news. I guess during war you have to find a way to live as normally as possible, no matter where you are. sir, aren’t you afraid that someone is going to kill you and your loved ones because, of the brave stand you have taken against the Evil activities Russia has and is committing all over the world. p.s. your dark stories helped me when i was low,they reminded me though, i maybe going through a rough patch.there are people all over the world who are having a much worse time. Whats that sound at 14:44? You should google “Tashkent” to see where this city is really located! The patent, beside the intellectual property thing, is a tax to be paid to the authorities when one wants to get permission to do something. There generally are patents for operating a business (a commercial patent), and also patents for getting a license plate for motor vehicles. At least here in Chile it’s that way. There are many kinds of commercial patents, depending on what kind of commercial activity you want to engage in. One of the most notable is the alcohol drinks expenditure patent, but you also need a patent to open a professional office, to open a supermarket, etc. Here in Chile patents are paid to the municipality (somewhat equivalent to a town hall maybe). It’s also generally bound to an address, AFAIK. It’s also additional to other taxes like sales taxes, VAT, income taxes, capital gains taxes, etc. tl;dr: This kind of patent is a tax you have to pay, usually to the local government, in order to get permission to open and operate a commercial business.